We sat down with the talented Thorin Loeks to talk about his music, adventures and upcoming presentation at the Mountain Melodies Show on Sun, Feb 11 at the Cinematheque Theatre. Check out the interview below! What will your presentation be about and will we get the chance to hear you perform your music live on stage? A few years ago I had this kind of crazy dream to bicycle across North America solo with a guitar on my back busking as I went to pay for the journey. I had very little previous bike touring experience and barely knew how to change a flat tire, but I went ahead with it anyways and hitch hiked down to Portland, Oregon. There I bought a bike with some of the remaining money from a tax return, starting out on a beach in Astoria heading vaguely east towards the Atlantic Ocean. This ended up being one of the best decisions I have ever made. Since then I have bicycled and canoed about 15,000 km across North America camping, busking, songwriting, journaling, and filming along way and ended up recording a couple albums during the winters inspired by these experiences. My talk is basically about what I learned on these journeys about myself, others humans, community, the natural world, and some of the common threads that I found come together to make life meaningful. The plan is to include a few videos of my journey backtracked with some original songs to compliment the talk along with a few photos, and then end my presentation with a couple live performance pieces before switching back to one of the two amazing curated adventure films selected by the festival for the evening. We can’t wait to hear you perform live on the VIMFF stage! When did you start singing and writing music? What motivated you to combine your passion for music with your passion for adventure? Well, my mom was an opera singer on Broadway back in the 70’s, she had won a couple tickets for a ski trip and was supposed to go with some guy who was a no show, my dad ended up being the ski instructor and after getting married they decided to move up the Yukon to start an adventure canoe guiding business. My sisters and I were born and raised up there so I guess you can say I came across my interests honestly and combining them was an organic process. I started playing piano and singing at a very young age, guitar followed in my teenage years which I loved for being so easy to carry around. The songwriting really came in full force when I started heading out on my own larger adventures in my late teens and early twenties. Your adventures are quite impressive and all involve either a canoe or a bicycle (or both! ), your music, and connecting with the people and communities you meet along with way. Which of your trips is the most memorable to you? That’s a tough question! All of them have been very memorable and meaningful for different reasons. But if I had to choose, I would say that my 3,800 km journey from source to sea down the Mississippi River in a canoe a few summers ago was one of the most memorable in that it passed through an amazing cross section of ecosystems, countryside, towns, people, and cultures. Passing through some of the most iconic musical regions and cities in North America was an incredible treat and had a significant influence on my songwriting. What inspires you to pursue a nomadic life? What surprised me early on and is constantly refreshing about these journeys is how little is actually necessary to be very happy. Simplifying my life through these journeys has helped me realize that gratitude and cultivation in the quality, kindness and joy of our relationships and experiences is where a lot of the true wealth in life is found. Which show are you most excited to see this year during VIMFF 2018? That is very hard to say because there are going to be so many incredible speakers and films this year. That being said, Iranian adventurer Parvaneh Kazemi who start climbing at the age of 35 and now is the first woman in the world to reach the summit of Mount Everest & Lhotsie is high on the list. Where can we find more of your music or get in touch with you? You can get in touch with me and find all my music through my website www.thorinloeks.com. You can also find both my albums on Spotify, Itunes, Youtube, Bandcamp, and Soundcloud. 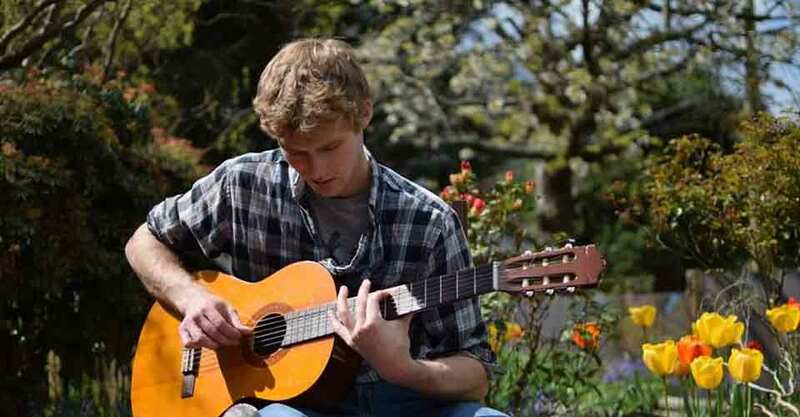 Catch a sneak peak into Thorin’s music in the video below or on his website, and catch him presenting (and performing!) this coming Sunday. Tickets to the Mountain Melodies Show can be purchased here.